Inside California Education is a joint production of KVIE-DTV and NationalEdOnline, a California 501c3 nonprofit organization. Because of their missions to provide educational information and resources to the community, KVIE and NationalEdOnline have partnered to produce a new public television series. Inside California Education gives an in-depth look at education and explores the issues and stories which students, parents, educators, community leaders and residents of the state will find informative and interesting. By utilizing a distinguished Advisory Board and viewer feedback, Inside California Education will research and produce program segments all over California. From small rural districts to big city schools, Inside California Education will travel the entire state to tell the stories about education which most viewers have never seen. KVIE, established in 1959, is the Public Television station serving the Sacramento, Stockton and Modesto market. KVIE’s programming can be viewed on their three digital broadcast channels as well as over cable and satellite systems. KVIE provides educational programs and services for the young and lifelong learners. Local and national productions like America’s Heartland engage the mind and spirit to promote personal and community growth. The first season series consisting of 13 episodes will begin to air throughout California on public television on all of the California affiliates beginning January 30, 2017. Local station carriage, dates, and time will vary. Please check for programming schedules in your local PBS television guides or online at www.insidecaled.org/schedule. NationalEdOnline is a 501(c)(3) non-profit organization focused on new technologies that enhance online and virtual learning. NationalEdOnline offers a broad range of online training solutions, and has developed and produced training content in the areas of employee and staff development, mandated training, computer application training, and information webinars and webcasts. 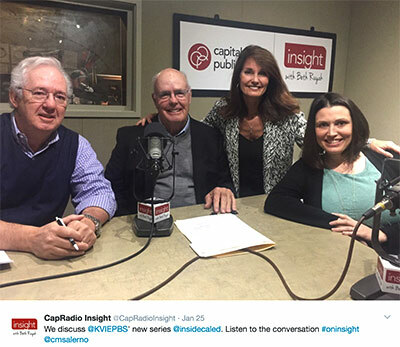 Larry Miles and Rick Launey, Executive Producers of Inside California Education along with KVIE Series Producer, Christina Salerno, talk with Beth Ruyak on Capital Public Radio Insight about the new series.